The Preserve Committee conducts a meeting on Picnic Point. Photo by Bryn Scriver. 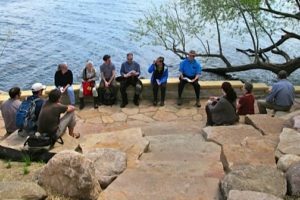 The Preserve Committee is a shared-governance body made up of faculty, staff, and student members, which advises UW-Madison administration and staff on policies for stewardship and use of the Preserve. Preserve Committee meetings are open to the public. For meeting dates, times, and locations, please check the events calendar. Academic staff and faculty are appointed for a three-year term, with a maximum of two terms. Student members are appointed by the Associated Students of Madison for annual terms.